Miss Heidi holds degrees in Early Childhood Development, Education and Human Services. She was born and raised in Irvington, New York. She has since lived in Delaware, Costa Rica and now has her home on St Kitts, a small island in the Caribbean. Throughout her life Miss Heidi has been dedicated to caring for and educating the young and old alike. Though she has made writing her full time career and is currently working on additional books, she continues to work within the education sphere, committing to non-for-profit work for Hands Across the Sea and development of project based curriculum for Plant a Seed to Read. 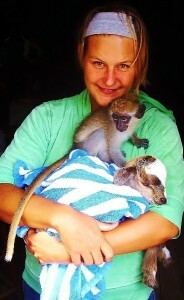 Her love of photography and writing was rekindled by the beautiful Island on which she lives and the animals she loves. This has led her to create a second and third series based in St Kitts. Parents, teachers and animal lovers alike have commented on the laugh out loud and feel good moments our furry friends share. You can too! Sharks kill fewer than 10 people per year. Humans kill about 100 million sharks per year.